A video shared by CGTN shows how the rescue took place. 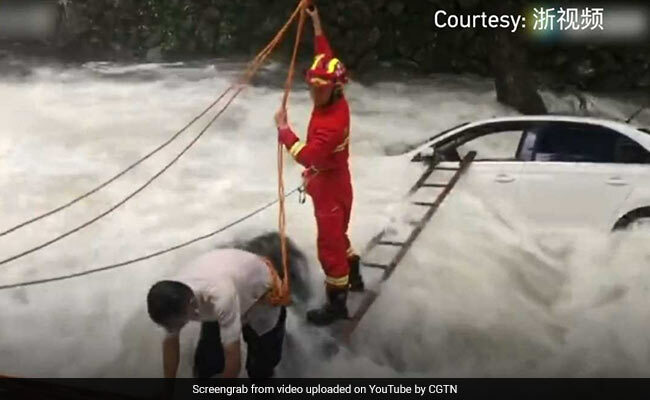 Firefighters in China have earned accolades for rescuing a man from his car that was stuck in the middle of a surging, flooded river. The incident took place in the Zhejiang Province of east China, and a video of the dramatic rescue was shared by China Global TV Network (CGTN). The video shows a team of firefighters working together to rescue an unnamed man from heavy floods. The man, thankfully, managed to escape without any serious injuries. After reaching the car stuck amongst rocks in the middle of a surging river with the help of a ladder, a firefighter rescues the man with the help of some rope. A crowd of spectators is seen watching and filming as the man is guided to safety, where a team of firefighters waits for him. The video was shared online yesterday, and has collected many comments praising the firefighters. "Great work, I salute," writes one person on Twitter. "Now THAT'S a rescue!" writes a commenter on YouTube. It is not known how the man ended up in the middle of a flooded river. In a similar incident back in April, a woman in China was rescued from an overflowing river - again by a group of firefighters.